We had sun, clouds and wind, but it was beautiful and I wouldn't have waned to be anywhere else. Sign on Sable Pass confirming that you are not alone. I haven’t been very good at updating my website or blog, partly due to laziness and partly due to slow internet. But the return of geese, signaling the end of a long winter, is hard to pass up making an entry about. So, here are some photos from this morning at Creamer’s Field Migratory Wildlife Refuge in Fairbanks. A little muddy but plenty of grain to welcome our spring migrants. This guy is a little dirty after his long trip north. I only saw three swans, but they were in the front of the field. There is more than one way for a goose to arrive in Fairbanks! This goose is riding on top of the car belonging to a wildlife biologist at Alaska Fish and Game. Nice to see a guy that loves his job! Sometime, no matter how much you like a place, you need to get away; especially after a long, cold, dark winter. My sister conveniently lives in Gig Harbor WA, just South of Seattle, and April is a great time to visit her. I was full of hope for sunshine and warmth to soothe my aching psyche after the long winter, but that was not to be. The beautiful 60 degree days that gifted the area the week before we arrived turned to grey, cool and rainy the day we arrived and stayed the entire week. Weather is a relative thing, and it turned out better than Fairbanks where it snowed seven inches while we were away. Despite the weather–a little liquid snow didn’t stop us–we had a fantastic time. My sister and her husband are gracious hosts, and go all out to ensure we have everything we could possibly want. They really don’t have to do that, how much better can it get than family, a clean house, no dog hair and food on demand? I always feel at least somewhat guilty for having my sister run me all over the place, but…. There are malls everywhere in the SeaTac area, my sister knows all of them, and we visited a couple. Furniture shopping, fine dining, running in shorts, the weekend in Seattle, zip lining and “The Jersey Boys,” were several other highlights. Chambers Bay Running Trail. What a treat to run in shorts! This is a fun trail around a golf course on the water. My favorite spring flowers, don’t see many of these growing in Fairbanks! Panera; I love this place and the cobblestone muffins and everything else! On the ferry to Vashon Island, always wondered what was there; answer: not much. 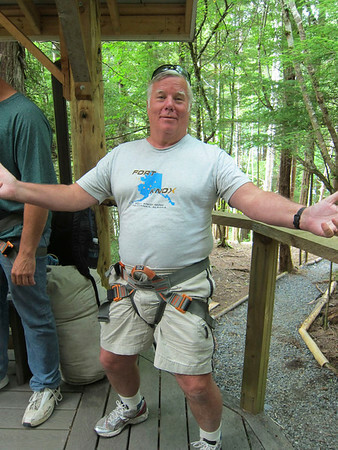 What to do on a rainy day but ride the zip line at Camano Island….. I have now been to Talkeetna twice. Talkeetna sits at the end of the Talkeetna Spur Road about 14 miles north off the Parks Highway, roughly four hours south of Fairbanks and two hours north of Anchorage. It is a funky little town, a blend of old and new, a base for Mt McKinley climbing expeditions in the spring and Mt McKinley flightseeing in the summer as well as other tourist activities. It is also a great place from which to view Mt McKinley, if you are fortunate enough to be there when the weather permits. I’m pretty confident Talkeetna makes its own entertainment as well. Usually when we pass the turnoff for Talkeetna we are going to Anchorage or returning home and always in a hurry. Several years ago we spent a couple days there with some friends who were visiting, mainly so we could take a flightseeing tour with K2 Aviation. The tour was a highlight, but we passed the town off as a funky place and said , “been there, done that!” This year, a new attraction opened, Denali Zipline Tours, and Talkeetna was once again on our list of places to go. We finally made it last weekend, combined with a trip to Denali Park. This time we were by ourselves and had the time to explore a bit after the zipline. The zipline tour was fun, and I’d definitely do it again. The weather was perfect, allowing us magnificent views of Mt McKinley and the Alaska Range from the zipline platforms as well as from several other places in town, including our room at the Talkeetna Alaskan Lodge. After the van deposited us at the tour office in downtown Talkeetna following the tour, we walked across the street to the Denali Brewing Company and had some of the best nachos I’ve ever had and an ice cold glass of Single Engine Red, a tasty red ale named to celebrate Talkeetna’s aviation history. I hope I can find it in Fairbanks, if not, we’ll have to make a detour to Talkeetna for a growler or two when we’re headed to Anchorage! I have to say, Alaska has some awesome breweries. It has been a sad week at HuskyHouse; on June 21 we lost our beautiful Clemmie to metastatic prostate cancer. In February 2001 we adopted Clemmie from Animal Control, he had been a three-time loser that was in the both Anchorage and Fairbanks lockup within 30 days. His insatiable love of life and freedom was infectious, we didn’t now his birthday so we set it at July 4th in honor of his quest for independence. After all, it was that very independent streak that brought him to us. Clemmie fit in perfectly with J Clyde, our “first born” Siberian, and later ET, who was devoted to him. He doted on the redheads and became “the enforcer.” Clemmie has now joined Clyde on the other side of the Rainbow Bridge, that happy place where all pain is gone, and he is catching him up on our life, ET and the crazy redheads. There wasn’t a day that Clemmie didn’t love us unconditionally and show his appreciation for being adopted, and vice versa. I miss you so much, you sweet boy. See you on the other side. In early December we went Outside (outside of Alaska) to visit my sister in the Seattle area. It is always nice to visit my sister and spend some time in civilization. Of course, the definition of “civilization” differs for most people, for me it is virtually any place other than Fairbanks, where there are stores other than Fred Meyers, WallMart or Sears and there are decent restaurants. Anchorage just barely qualifies, but Seattle is perfect; lots of Malls with a Nordstrom in every one and awesome places to eat, plus a compact and diverse downtown and, of course, Pikes Place Market. What is not to like…oh, yes, with civilization comes lots of people and traffic. But I can handle that for a few days to partake of the benefits. A build your own yogurt place! The Nirvana of civilization; an Apple store! Actually, winter has been here for a while; I think it is officially winter when the first significant snowfall stays on the ground. Daylight savings time is gone for another year. In Alaska it doesn’t matter whether we are on standard time or daylight savings time; summer is light and winter is mostly dark. I am glad I don’t live in Barrow where the sun doesn’t rise for two months. I am happy when it snows, because winter can seem way longer than it is when there is not enough snow to ski or snowmachine, and I love running with the dogs because they are so happy when there is snow between their toes. They (not me) would rather it be 20 below than 20 above. It was three years ago today that we brought home the redheads, Pelly and Dawson. I have threatened countless times to open the door and point them south toward Wasilla, where they came from, and probably will continue to do so, but I wouldn’t change a thing! Clemmie loves to play with them and takes his role as enforcer seriously. Although it took ET (my canine soulmate) over a year to accommodate to them, he now plays with them and he and Pelly instigate daily singing sessions. I could do with a lot less hair in the house and Jeep, but the six of us are a very happy family! Comments Off on It’s Been Three Years!